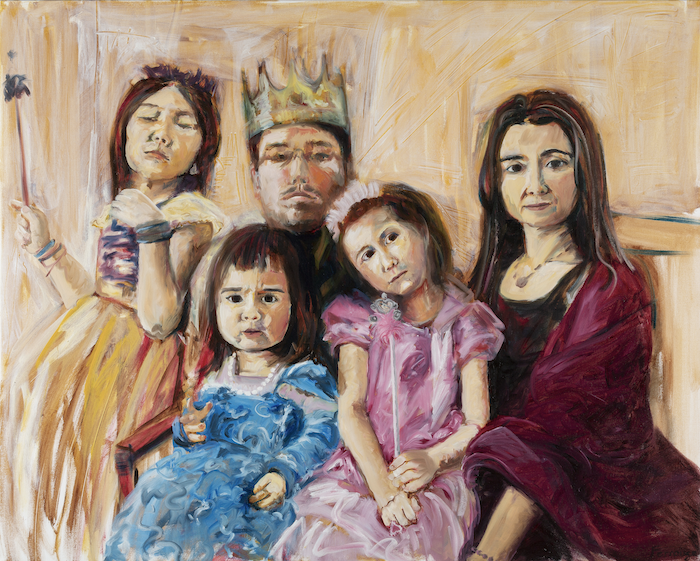 The Royal Family, is a family self-portrait completed in 2016. The artist’s three daughters are wearing dresses given by a grandparent at Christmas which caused the impromptu photo that inspired the painting. Crowned in the middle of the portrait with a serious gaze, is the artist’s husband, appearing with just enough space between the girls. The eldest daughter looks down her nose, and the younger girls seem to have conflicted thoughts about the situation. The queen is not wearing her tiara and looks out at the viewer with a questioning look. Further examining the daddy-daughter relationship is Ferrouge’s latest work; Laundry Supervision in the Big Brown House. The young daughter tenderly looks over the father sorting socks as she balances on the arm of the couch. He is wearing a white dress shirt and shorts, indicating his professionalism combined with his off-work duty. In this house, there is no task too low for the bread-winning man, and no job description un-attainable for the littlest woman. Over the past few years, Christine Ferrouge has gone to the canvas to explore her daughters’ attraction to being a princess. “If they are princesses, then I am the queen!” Ferrouge said in response to her daughters’ declaration of their royalty. “Big brown house” refers to the tan-colored development tract housing where the artist's family lived temporarily in Fresno last year. The anonymous interior surrounding them is drab, but the warm lamp light ignites a feeling of home and comfort. In this 5x6 foot canvas, Ferrouge combines large gestural brushwork with raw spaces, and careful attention the figures’ shadowed expressions and blurred movement. 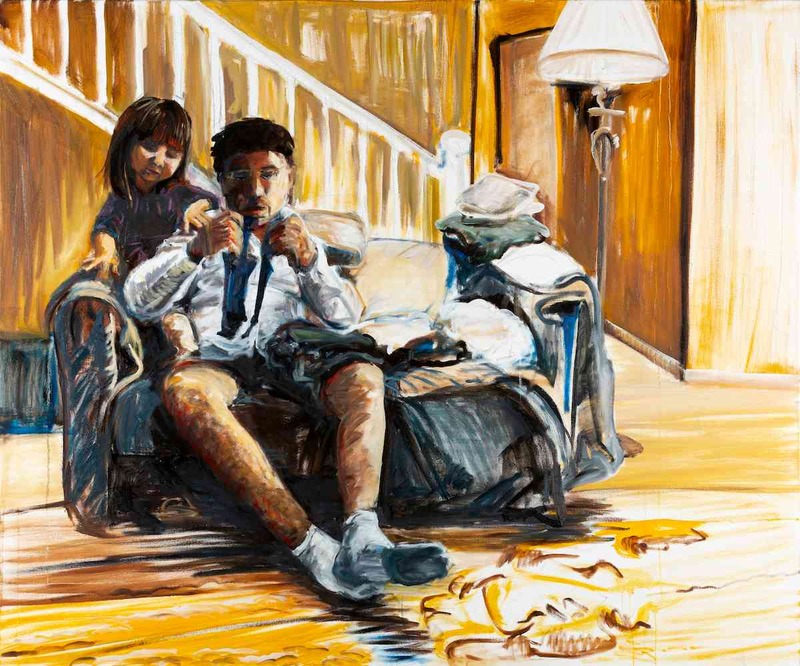 The result is a finished painting that contains all the excitement of an under-painting or sketch. These works are on view at Gallery Ferrouge inside Werkshack on 25th Street in Uptown Oakland, California. Show ends this month. Look for new paintings in-progress on view next month as the artist prepares for her upcoming solo show at Autobody Gallery and Studios in April 2018.